Mrs. Margaret Emefiele, the wife of the Central Bank Governor, Mr. Godwin Emefiele, has been kidnapped by gunmen, according to SaharaReporters. The online news platform said it gathered from a source close to the CBN governor that she was abducted along the Benin-Agbor Road on Thrusday and that the kidnappers have demanded a ransom. THE CITIZEN is yet to verify the report. 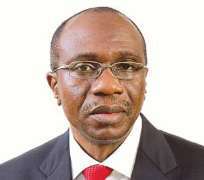 Officials of the CBN were not immediately available for comment and the CBN governor has yet to comment on the report.